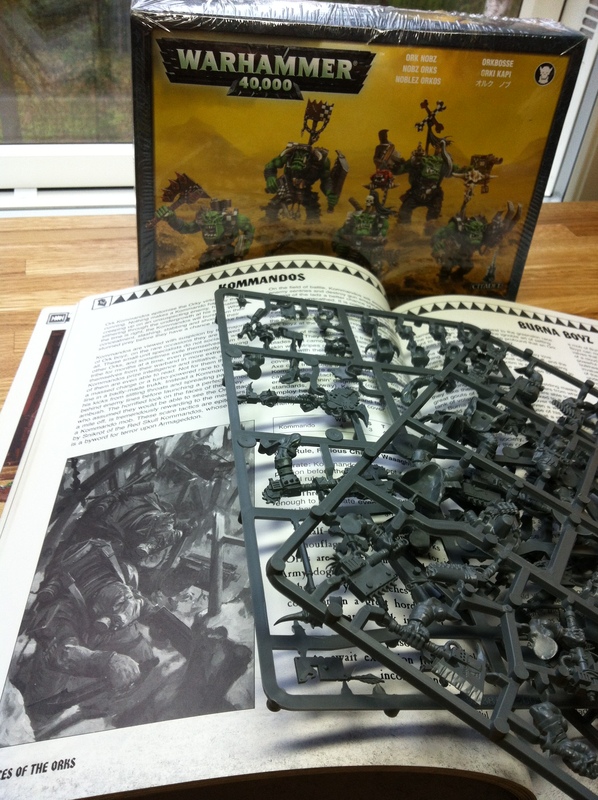 Hobby reboot 2015 – ORKS!!! During this time I have not completely forgot my projects however, NO! After the Invitational I felt that it was time to take new direction. with Terra Dominatvs project I studied the more realistic ways to do weathering and Im interested to continue on that path to create even more realistic feel to my miniatures… so during my break I have bought some new oil colours, a new technique I haven’t tried before + some pigments from Forge World I can’t wait to try out! Orks, yes Orks;) The bane of the imperium of man, Green and mean killing machines. I have always been little disappointed when seeing new Ork releases, sculpting is great, ideas are cool but to me, they still lack something, they don’t look that dangerous nor fierce. they look bit cartoonish not like they do in the artworks. 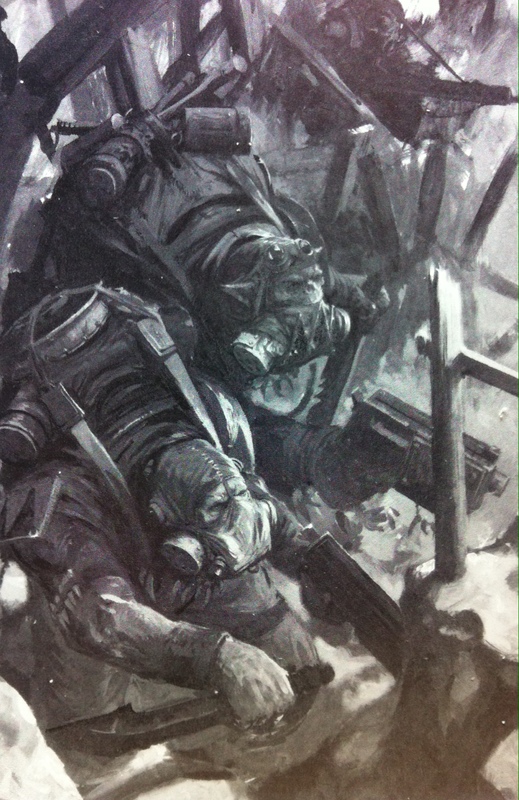 If you study the artwork in the Ork codex you see fierce creatures that look they would rip a Space Marine apart in split second!!! 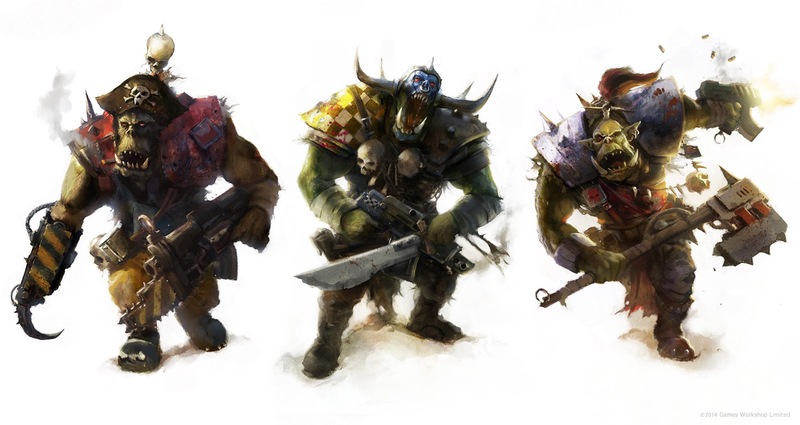 Im about to start a small Ork warband, something that could be described as “Da Speshul Forses” I will start out by building a squad of Kommandos they will later be followed by some other elite unit s in the future. Modelling vice I’m looking to introduce some of my own personal vision about how Ork should look like. I will alter the anatomy by mixing parts between the ork Boyz and the Nobz sprues. Painting will take my vision even further by adding strong sense of realism to the weathering on the miniatures and their bases. Time to get back in action!!! Please say you’re going to art-scale these Orks! Now that’s interesting! I have been an Ork Warlord myself for several years, and I concur on many of the things you said – I think GW got Orks pretty well at the beginning of 3rd ed, with a shift away from those gibberish-talking, ridiculous caricatures to something more brutal, dangerous and no-nonsense. I’d say the biggest influence in this has been Brian Nelson’s models and Andy Chamber’s spin on background and rules. Sadly, from then on GW has been steadily moving back to the “roots”, highlighting the laughable side over the feral one. So I will follow very closely what you’re up to with this project, certainly it sounds like you’re starting off in a promising direction. That said I’m really looking forward to see some businesslike and no-nonsense ork kommandoz from you Mikko. I think you can strike the perfect balance between gritty and still not-too-serious. But I think that is not the real topic here anyway, so let’s see what Mikko will come up with. They only became a “parody” in 2nd edition. They sort of jumped the shark in that codex, exaggerating the clowny and colourful side. If you go back and read the extremely well written RT era sourcebooks like “Waaagh the orks” or “´Ere we Go” they´re much more nuanced. Very curious what your take on the Orks will be. The sculpting on some of the current orks are somewhat disappointing in my opinion. For example, the current plastic nobz are definitely not an improvement on the metal ones from ’99, especially the faces. I have to echo was others here have said, Brian Nelson really made the Orks into a race that I was interested in with his sculpts for the 3rd edition (and the models he did for Gorkamorka beforehand). Seb Perbert has done a pretty good job of taking Nelson’s ideas and making newer Ork models, but none of his stuff has the same savagery as Nelson’s. OK – I am going to hold my breath until the first WIP are up. Next Post Imperial Assassins dispatched!